AMES, IA – BASF is joining the Iowa Soybean Research Center at Iowa State University as an industry partner to support emerging technology and innovations to help soybean growers produce high yielding, high quality soybeans. The Iowa Soybean Research Center, a partnership between the Iowa Soybean Association and Iowa State University, was created in 2014 to forge strong public-private collaborations to support Iowa soybean growers. Julia Daum, BASF senior program lead for trait research, will represent the company on the center’s industry advisory council, which provides input on research priorities. “BASF is committed to supporting the industry, and we believe it is important to partner with organizations like the Iowa Soybean Research Center," said Daum. 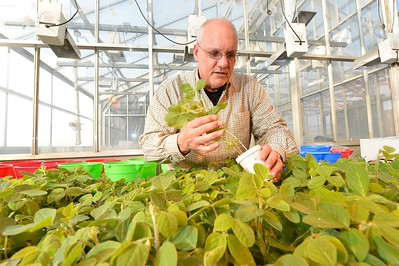 “We are excited about the research center’s new opportunities and innovations for soybean growers that will provide long-term benefits for their operations." “We welcome BASF’s commitment as an industry partner and see it as an important step in how the center facilitates public-private collaborations to better meet the research and production-information needs of Iowa soybean farmers,” said Ed Anderson, senior director of research for the Iowa Soybean Association and chair of the Iowa Soybean Research Center’s industry advisory council. BASF Corporation, headquartered in Florham Park, New Jersey, is the North American affiliate of BASF SE, Ludwigshafen, Germany. BASF has more than 20,000 employees in North America and sales of $19.7 billion in 2018. BASF creates chemistry for a sustainable future, combining economic success with environmental protection and social responsibility. The approximately 122,000 employees in the BASF Group work on contributing to the success of customers in nearly all sectors and almost every country in the world. Its portfolio is organized into six segments: Chemicals, Materials, Industrial Solutions, Surface Technologies, Nutrition & Care and Agricultural Solutions. Worldwide, BASF generated sales of around 63 billion pounds in 2018. BASF shares are traded on the stock exchange in Frankfurt (BAS) and as American Depositary Receipts (BASFY) in the U.S.
BASF’s Agricultural Solutions Division works with farmers, agricultural professionals, pest management experts and others to develop and maintain sustainable agriculture and healthy environments by investing in a strong R&D pipeline and broad portfolio, including seeds and traits, chemical and biological crop protection, soil management, plant health, pest control and digital farming. With expert teams in the lab, field, office and in production, the division connects innovative thinking and down-to-earth action to create real world ideas that work – for farmers, society and the planet. In 2018, the division generated sales of 6.2 billion pounds. More at www.agriculture.basf.com or any of BASF’s social media channels. The Iowa Soybean Research Center was established in 2014 by Iowa State University in partnership with the Iowa Soybean Association. The center was founded to increase soybean production and profitability for Iowa farmers through coordinated research efforts involving ISU, ISA and the private sector. Information on becoming an industry partner of the Iowa Soybean Research Center is available by contacting center director Greg Tylka, at 515-294-0878 or ISRC@iowasoybeancenter.org. More at http://www.iowasoybeancenter.org/. Iowa Soybean Research Center Director Greg Tylka.